I've been searching a way how to do this for a while now, thought I might share some info how it's done. My Phone is a Nexus 5X (upgraded to Android 8.1), not rooted. I don't have much experience with this so your mileage may vary. Also make sure you have at least 4-5GB space. 2) Wait for the initial setup to finish and it will boot you to a simple Window system with a terminal. 3) From there type "su" to switch over to the "system's root" (not actual phone's root). 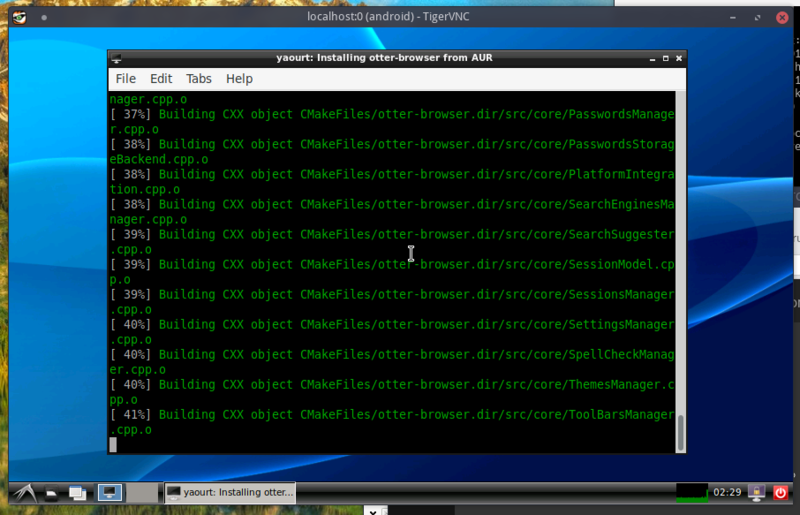 4) type: apt-get update > when done > apt-get install lxde (for lxde desktop). 5) Wait for all the packages to download and setup (may take a while and have your charger readily available). 6) When all is done go into ULA > go to Sessions list > Kill service on your OS > relaunch it and should boot you to the desktop. Restarting the X Server should reload with the correct display settings. I'm running SailfishOS on Sony Xperia XA2. No need for chroot and such, but it does rely on libhybris hack. For normal Linux with proper upstream drivers, we'll have to wait for Librem 5. If only I knew for sure that the Librem 5 can handle office work and a bit of multitasking, I could see it as a replacement for my aging laptop and justify the cost of what could otherwise be a very nice PC upgrade. As it stands, call me old-fashioned but why anyone would pay hundreds of dollars for a phone that will be obsolete, lost or broken in a handful of years is still beyond me. I've toyed with it for some more, most of it is functional however you can expect random errors around many corners. For example I can use Libreoffice,GIMP and Firefox without issues, but fails to apply a simple icon theme in Xfce and I have yet to successfully start pulseaudio. It's a nice learning experience, but far from a desktop os in your pocket. Shmerl I'm running SailfishOS on Sony Xperia XA2. No need for chroot and such, but it does rely on libhybris hack. For normal Linux with proper upstream drivers, we'll have to wait for Librem 5.
nice tutorial. I'll give it a try, what's the difference with the other apps that also do the same like linux deploy. anyway, the problem I had is that it was really slow, I have an old phone a moto e2. I also tried sailfish os, it's a great, I like that it uses rpm packages, but unfortunately the port for my phone lacks the android alien subsystem, so there's lots of apps that don't run. chancho_zombie nice tutorial. I'll give it a try, what's the difference with the other apps that also do the same like linux deploy. terminal > type "su" and then the name of the program and I have yet to get sound working. On the good side of things, I've been able to run firefox and browse youtube (without sound), run Gimp and Libreoffice and basic programs like calculator and a text editor. I also tried a couple of games but they crashed upon trying to create the window. I'm running arch, and managed to install yaourt now. make it with makepkg -si it will install fakeroot to opt. now you can install yaourt !